Donald Trump's lawyers will tell him. Suing the NYT means they get to investigate you with the court's blessing. It's as habitual as his bragging about all the times he's assaulted women. Donald Trump loves to sue people, and threaten to sue news organizations. On the suing people with less money for lawyers than he has, he's fine. But on the news organizations side of it? Not so much. Trump frequently threatens to sue people for saying mean things about him, but rarely follows through. The Republican presidential candidate has threatened political ad-makers, a rapper, documentary filmmakers, a Palm Beach civic club’s newsletter and the Better Business Bureau for lowering its rating of Trump University. He’s vowed to sue multiple news organizations including The New York Times, The Wall Street Journal, the Washington Post and USA TODAY. He didn’t follow through with any of those, though he did sue comedian Bill Maher, an author over a single line in a 276-page book, and Miss Pennsylvania. ...“Plainly, the guy uses lawsuits as a tool of intimidation and doesn’t care how much he clogs the courts with nonsense,” Maher said in an interview. "Anyone who files a lawsuit for defamation in a case like this, involving allegations of sexual misconduct, is asking for trouble. This is when we say, be careful what you wish for. In the discovery process, he has said, 'I never did these things.' He said to Anderson Cooper, 'I never kissed a woman against her will, I never groped a woman, against her will.' Well, in discovery, we can find out ALL the things he might have done, and with WHOM, he might have done them." 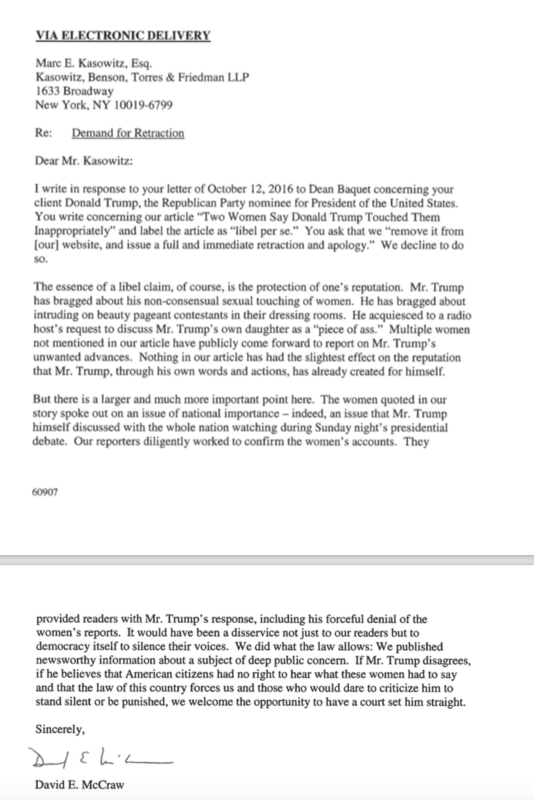 The New York Times has responded.